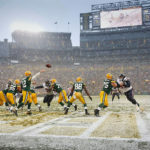 Photos From The Green Bay Packers vs Oakland Raiders NFL Football Game. Not that I’m complaining about the Green Bay Packers having such a great season and being undefeated, but when the Packers get out to such a huge lead the action can get a little boring in the second half. I almost thought I was at a preseason game. I was very happy with a couple of the features I got before the game started. I poked my head into the bowl a few hours before kickoff and knew I had an interesting shot waiting for me in the center of the field when I saw a half dressed player, Oakland Raiders’ Lamarr Houston, taking in the warm December temps. The second feature was of Steve Tate of DeForest. WI. 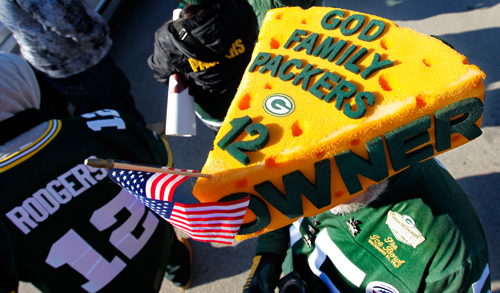 You can find Steve and his Packers cheese head with the word owner on it at most games. 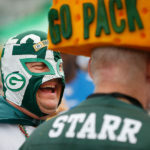 Fans who own Packers stock can call themselves owners and the number of owners is rapidly going up with the sale of an additional 250,000 shares of stock. As for action, I did okay. I was in position for a few nice defensive plays by the Packers including a couple of interceptions and Lambeau Leaps. As for offense it was nice to see Ryan Grant get his running game back into gear. 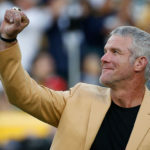 So, the Packers are 13-0 on the 2011 NFL football season after defeating the Oakland Raiders 46-16 at Lambeau Field in Green Bay, Wisconsin on December 12, 2011. 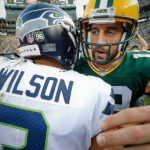 It will be exciting to see if the Packers can put together a perfect season. Oakland Raiders' Lamarr Houston gets acclimated to the weather at Lambeau Field a few hours before kick-off. Packers stock owner Steve Tate before the game. Green Bay Packers' Clay Matthews warms up before the game with a leaping catch in the end-zone. 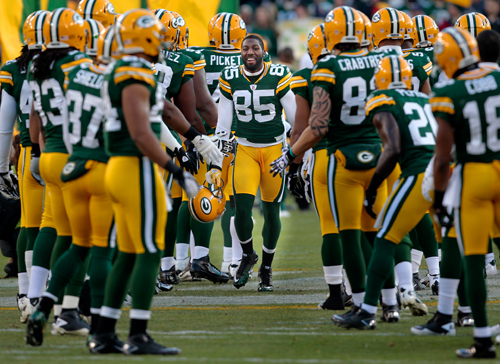 Green Bay Packers' Greg Jennings is all smiles during player introductions. 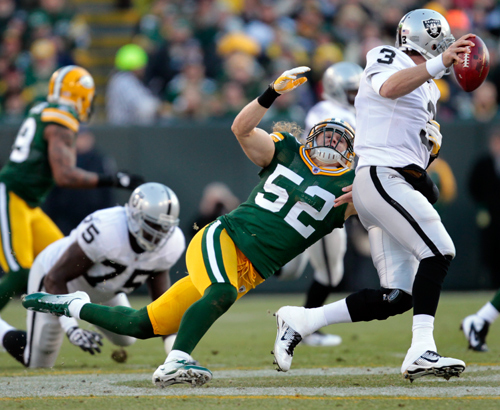 Green Bay Packers' Clay Matthews pressures Oakland Raiders quarterback Carson Palmer. Green Bay Packers linebacker D.J. Smith pulls in an interception in front of Oakland Raiders wide receiver Darrius Heyward-Bey. Green Bay Packers linebacker D.J. Smith gets tripped up by Oakland Raiders quarterback Carson Palmer as he runs back an interception. Green Bay Packers running back Ryan Grant eludes Oakland Raiders defensive back Mike Mitchell and Michael Huff. Green Bay Packers running back Ryan Grant gets tripped up just short of the end-zone. Green Bay Packers Tramon Williams breaks up a pass intended for Oakland Raiders' Darrius Heyward-Bey. Green Bay Packers quarterback Aaron Rodgers gets the ball knocked loose by Oakland Raiders outside linebacker Aaron Curry. Green Bay Packers linebacker D.J. Smith intercepts a pass intended for Oakland Raiders tight end Kevin Boss. Green Bay Packers linebacker D.J. Smith celebrates his interception. Green Bay Packer fans show their love for beer as Green Bay Packers outside linebacker Erik Walden does a Lambeau Leap after scoring a touchdown. Green Bay Packers quarterback Matt Flynn gets sacked in the end-zone by Oakland Raiders middle linebacker Rolando McClain for a safety. 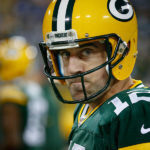 Green Bay Packers quarterback Aaron Rodgers watches the game from the sidelines during the fourth quarter with a comfortable lead. « Photos from the Green Bay Packers Tampa Bay Buccaneers NFL Football Game.